BetAmerica.com is a legal, secure and simple wagering service based in the United States. Continue reading our BetAmerica review. It offers traditional race betting (horse, greyhound and harness) at over 200 tracks around the world & fantasy sport betting across the MLB, NFL and NBA. The site is easy to use and it is possible to quickly navigate to your favorite wagering events. 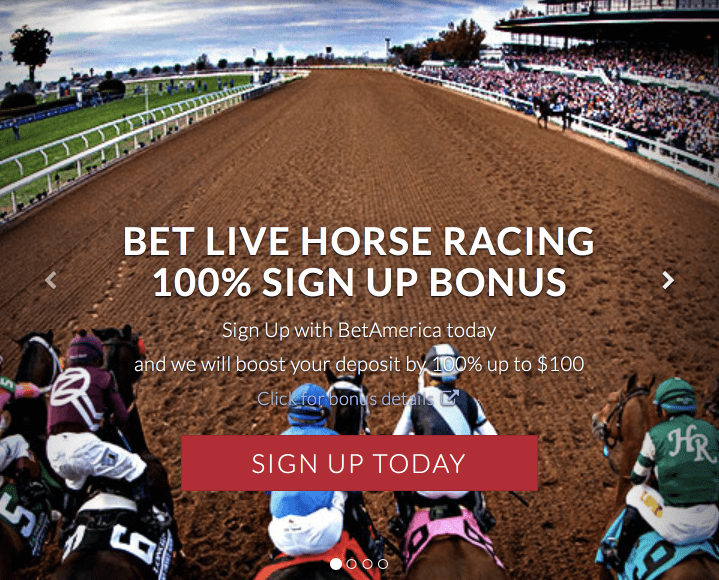 As well as this great service Bet America offers some great promotional bonuses, headlined by the $100 new sign up bonus. Further to this they offer a calendar of rotating bonuses that changes nearly daily. So with a great variety of games and promotions, you’ll always be entertained with Bet America. BetAmerica offers a range of bonuses and special offers for both new customers and returning players alike. The great thing about this service is that it offers a number of new different promotions every week. One of the most exciting opportunities offered by BetAmerica is the $100 new player sign up bonus. While you won’t get $100 automatically for signing up, the bonus is quite easy to activate and revolves around the value that you put in. The way it works is: Bet America will match your initial deposit when opening an entirely new account up to $100. The bonus will activate as soon as you create the account and make your first deposit. The bonus works across all BetAmerica products.This is the only signup bonus in the US which you can use across racing and fantasy sports. Further, to the signup bonus BetAmerica offers daily promotions across its entire range of playable games and sports. Within your account dashboard you will find a ‘promotions calendar’ that alerts you to exactly what promotion is offered on any given day. They offer something different nearly every day whether it’s on horse, greyhound or harness racing or on daily fantasy sports. What makes Bet America unique is its offering of both traditional track racing and fantasy sport wagering all in one service. It is simple to understand and both the mobile and online platforms are easy to navigate. With a huge range of fantasy games and over 200 racing tracks to choose from you’ll never be bored. What sets this service apart is its range of events to wager on, its ease of use and its dedication to service. Currently, Bet America only offers an iOS version of its application (that means only iPhone and iPad users), but Android and Windows phone users can still access Bet America by utilizing their web browser. The iOS app is well thought out, neat & tidy and very simple to use. You can find all kinds of information, live streams and trending data, so you’ll always be connected to the right knowledge. While Bet America offers a huge selection of events to wager on, with the app you will find it easy to navigate and to play. As an added bonus you can also access the help information and customer service right from the app. BetAmerica is truly easy to use. 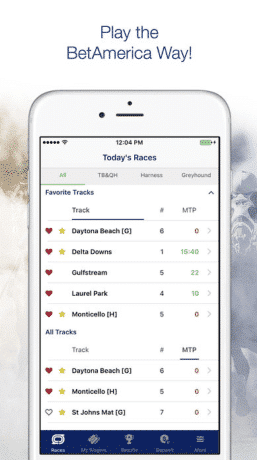 From the great scheduling system they employ to deliver live updates from over 200 racing tracks to the player information and line up interfaces for fantasy sports, everything is well thought out and intuitively designed. You will never be stumped as to what is going up or what races are coming up – they have a great notification system too. All in all BetAmerica makes it easy & fun to play on your favorite games. Bet America is part of Lien Games Racing LLC, a legal and regulated company located in the United States and licensed in the State of North Dakota by the North Dakota Racing Commission. BetAmerica is in full compliance with all applicable United States and Federal laws. Wagering is restricted in certain states. Account holders shall not make wagers from their account while physically located in one of the following states: Arizona, Iowa, Louisiana, Massachusetts, Montana, North Dakota, New York, Nevada, Oregon, Puerto Rico, Vermont, Virginia, and Washington. There is a variety of ways players may make a deposit or withdraw winnings from their account. BetAmerica attempts to make this service as easy as possible to keep players happy. First off you can deposit at a local branch or use the Pay Near Me service – where you can top up your account funds at over 7,000 7/11 locations and 8,000 Family Dollar locations. You can also use this service and therefore locations to withdraw your winnings – this alone is a flexible service. Additionally Bet America allows you to make deposits using eCash electronic transfers, Mastercard and Visa card (albeit for a small transaction fee), Neteller, Vanilla Reloard cards, wire transfers and a traditional check. There are pros and cons to all of these deposit methods but with so many options you will find a solution that works for you. Withdrawing your winnings is also a simple and painless process. As previously mentioned you can utilise the Pay Near Me service to make withdrawals at a number of 7/11 and Family Dollar locations. If you have a NetTeller account you are also able to make withdrawals from ATMs which is a refreshing and new concept for a wagering service. Bet America also offers withdrawals via electronic bank transfers and checks – however there may be a processing time of up to 5 days on these options. BetAmerica offers a number of options for player support. The first stop is a well thought out and very informational FAQ section. Here players will find answers to most simple queries such as deposit & payment information, what games can be played and also basic information about accounts and the service itself. 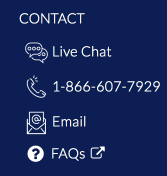 If you find yourself needing a more in-depth solution Bet America also offers a live chat system as well as email and telephone hotline support. They respond in a timely manner and can provide players with additional information if required. All in all their help service is friendly, fast & knowledgable. Bet America has a huge selection of entertaining races, games and sports to wager on. From traditional contests like horse racing, greyhound racing and harness racing to fantasy sports competitions ranging across the NBA, NFL and MLB, Bet America has you covered. To keep up with the truly global sport of track racing Bet America offers the option to bet on a large number of races from across the world. Their intuitive and simple scheduling layout makes it easy to wager on over 200 tracks from the US, Canada, the UK and other locations. 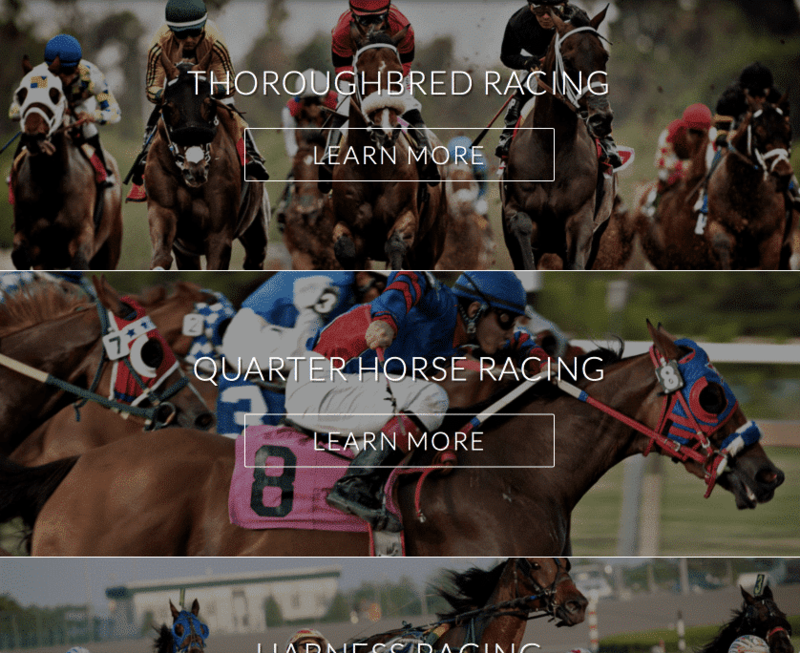 The types of wagered offered varies track by track, but generally you will find a great variety from single horse bets to trifectas and multi-race wagering. Winners are also paid full track odds on all wagers. There is no cap on winnings. Another great feature is the option to view your wagering history, so you can analyse which tracks you have been most successful at and view betting trends. The other main wagering type offered by Bet America is fantasy sports. If you have ever played a season with your friends you will be right at home here. Except with Bet America you can win real money and you don’t have to wait until the end of the season to collect! Currently, the service offers wagering on fantasy leagues in NBA, MLB and NFL – so there’s something for everyone. BetAmerica was formed in 2008 by a group of guys dissatisfied with both offshore betting services and the tradition ‘big’ wagering services. They were looking to create a simple way to bring together a range of events to play on in a simple and hassle free way. They have used their dedication to service and enthusiasm for wagering to pay out over $150 million to a huge number of players in the last 10 years. 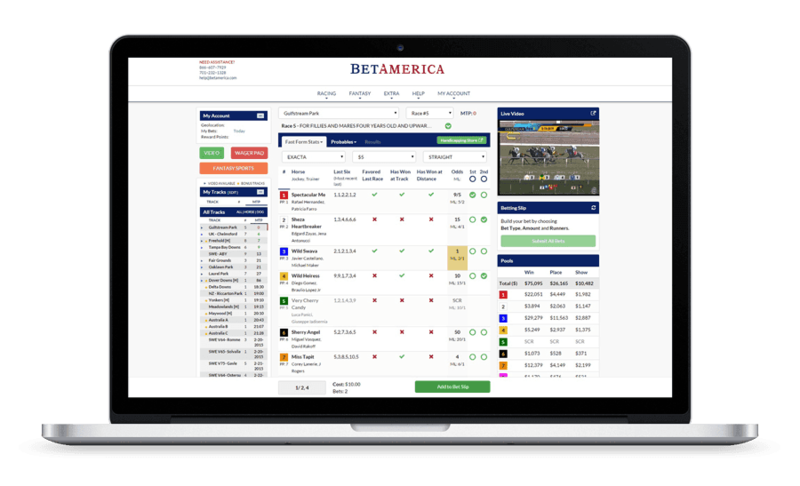 In 2013 Bet America launched their Fantasy Sports option for betting and now BetAmerica now not only offers the best of horse and greyhound racing, but also a legal alternative to betting on sports — all in a legal, trusted and secure environment. BetAmerica is great established service that offers a wide range of events and games to wager on. The firm’s dedication to service and variety means you will have a lot of fun here. Everything from the mobile app to the online interface is clean, neat and easy to navigate. A rarity, Bet America offers not only horse, greyhound and harness racing but also features an expansive fantasy sports section. You can find your traditional wagering here on 200 race tracks across the world and fantasy leagues for MLB, NFL and NBA – so there’s something for everyone. The $300 new player bonus is very simple to trigger and will ensure you start your account with BetAmerica with a bang. All in all it is a great service, with good support and many options. BetAmerica gives you security, simplicity and variety. "BetAmerica.com is the all in one stop for Daily Fantasy Sports, Horse Racing and also Greyhounds! "